Swirl Round Sapphire and Diamond Wedding Set | Shane Co.
Due to variations in device screens and browsers, stone colors may appear different on different devices. Eleven round diamonds, at approximately .38 carat TW, swirl around two round sapphires, at approximately .33 carat TW in this eye-catching swirl wedding set. The combination is breathtaking with a total gem weight of approximately .71 carat. 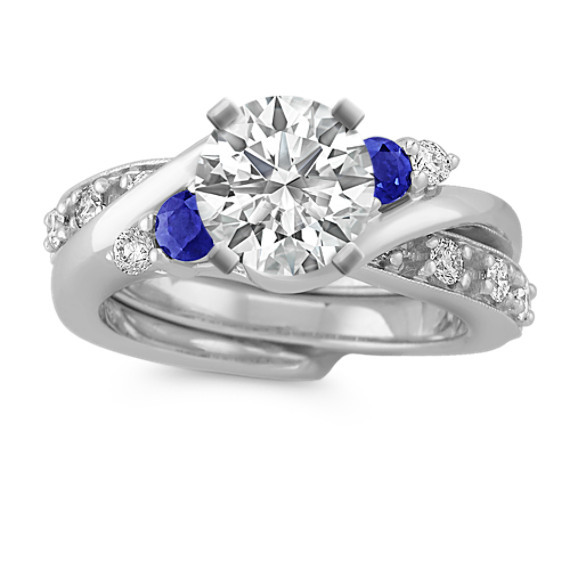 Add the center diamond of your choice to complete this delightful look. Gemstone Carat Weight :1/3 ct. t.w. My husband picked the perfect ring for me!!! We love Shane Co!